Congrats grads, you made it! The time has finally come to walk across the stage and become alumni, and our team at NYU.FASHION couldn’t be more excited for you. Check out these places for some pre-graduation pampering that will have you looking and feeling your best on this exciting day! On East Seventh Street, Rogue House Salon is one of our favorites! It’s homey, cute and super friendly – and we loved partnering with them earlier this year. Be sure to show your NYU ID and mention NYU.FASHION for a 20% off discount! A perennial favorite, DryBar has locations all over the city and offers beautiful blowouts. Check this salon out if you’re looking for a simple and effortlessly glamorous look! 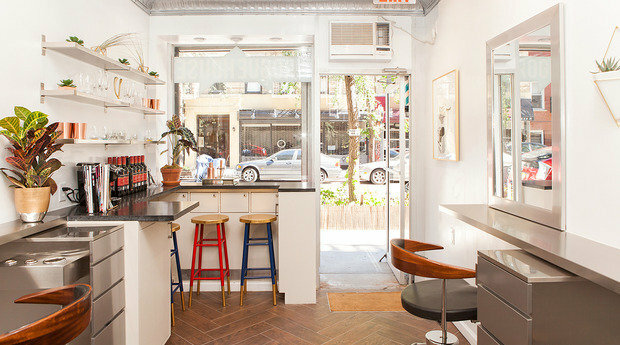 Blushington has two locations – one in Midtown and one on the Upper East Side – both with charming pink chairs and incredible makeup artists. Stop by before graduation and leave looking (and feeling) all ready for the stage! We've had such a great experience at their Midtown location and 100% recommend this makeup and beauty lounge for any of your pampering and beauty needs! Nothing makes you feel more grown up and ready to take on the world than a fresh manicure. And our friends at sundays in SoHo are here to help! In the studio, they develop and use products that are non-toxic, cruelty-free and vegan. And what better way to prep for graduation than with eco-friendly nails? New York is full of cute and quirky shops to get the grad in your life something special, but if you’re looking to branch out from NYU favorites like the NYU bookstore and the Strand, check out some of our favorites! Olfactory will help you create a personalized perfume (learn more about our partnership with them here) and Rebus specializes in beautiful, hand-crafted jewelry. You’re going to do amazing things, #NYU2018, and we can’t wait to see where you go in the world. But before you walk across the stage, make sure to treat yourself first – after four years of hard work at the university that never sleeps, you definitely deserve it! NYU, What Would you Wear to the Met Gala?